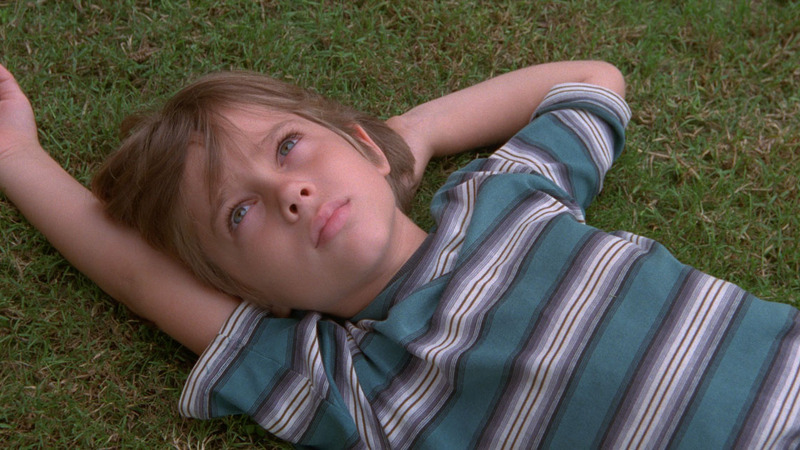 It’s fitting that Coldplay’s “Yellow” is the first note you hear in the new film Boyhood. We’re meant to be reminded of a specific time and the film wants to make sure we realize we’ve travelled back to the early 2000s. The Hives make a soundtrack appearance shortly afterwards, then a young looking Ethan Hawke mentions George W. Bush and 9/11, and then oh yeah, we’re sure. That’s the strongest feeling in a film that attempts to document all of the ups and downs – be they big or small – of a young life, it is one of potent recollection and remembrance. Remember when we all listened to “Crazy”? On the surface that’s Boyhood‘s whole structure and, in its obvious breadth, the point. I’m a sucker for a good coming-of-age story. Give me an awkward kid going through an uncomfortable high school period, or a gang of kids learning of what it means to leave childhood, and I’m on-board. But, if we’re being honest, it’s a tired premise. We’re familiar with all the obvious climactic events in those movies, we’ve seen that pumped up drama. As written and directed by Richard Linklater, Boyhood is different. We’re made privy to the memories of Mason Jr. (Ellar Coltrane) as he goes from ages 6 to 18. As you may be aware, this is not done via the help of multiple young actors but instead by watching the same boy age through those 12 years. The film is both a time capsule and a spaceship. Mason Jr. starts as a quiet, wide-eyed kid and ends as a gangly soon-to-be college freshmen. Any thoughts on Boyhood have to start there because this, on a basic level, is a towering achievement. Making a movie is difficult; making a movie over a 12 year period when anything – e.g. life – can happen to the principle actors, should be impossible. Just making it to the end is something special. Mason lives in Houston with his mother Olivia (Patricia Arquette) and sister Samantha (Lorelei Linklater, the director’s daughter). They have a modest life. Mason rides around on his bike and plays video games. He and a pal engage in some reckless graffiti. Mason’s dad, Mason Sr. rolls into town. It’s Hawke. We get the first taste of unrest. Mason watches his divorced parents fight on the front lawn. What does he see? What is he learning? Olivia is largely put upon and, in a bit of life-imitating-art, Arquette has a thankless role. Hawke gets to be the cool dad, taking his kids bowling, or camping or to an Astros (with Roger Clemens!) game. Olivia is stuck reminding her kids to do their homework. They move from Houston, Mason barely gets to wave goodbye to his friend. It’s not the first time this happens. Before moving out of their house, Olivia asks Mason to paint over the door frame that has some of its own benign graffiti: the growing heights of Samantha and Mason. It’s a small gesture, but poignant in its specificity. We had a door frame like that too, but our house was renovated and it got tossed out. Boyhood is not a perfect film. There’s a reason why you haven’t seen Coltrane (or Linklater’s daughter) in too many other films. The acting of many of its scenes, apart from Hawke’s effortless charm and Arquette’s honest pain, is pretty wan. There’s an inherent awkwardness there (as when Mason Sr. attempts a birds and bees discussion) that explains some of this away. Then there are scenes of foreboding that end up dissipating and shuffling onto the next. We grip our chair a little tighter during one such scene involving some teens breaking boards and chucking a hacksaw blade around. You just winced as you read that. We fear for the worst, but it’s just another dull night in small town Texas. Most often described as “shaggy”, Linklater’s first film, Slacker, had a similar shambling grace to it. That film had a camera following this guy, and then that lady, these people talking about this, and those people talking about that. It’s not surprising to see Linklater here again acting as both director and cataloguer. Though his career has taken him in diverse directions (family films with Jack Black, rotoscoping with Robert Downey Jr., a different form of time travel with Hawke and Julie Delpy), Linklater doesn’t need histrionics or hysterical drama. And while there are a couple moments of terror (mostly involving drunken husbands) in Boyhood, Linklater trusts the minutia of life to be dramatic enough. Mason moves to a new school. A girl tells him his haircut looks cool. He goes on a road trip with his girlfriend who later breaks up with him. His mom moves again. His father remarries. Mason ends up at the end of high school thinking about the uncertainty of his future. Is Mason anxious? Does he worry about where he’ll end up? What has he learned from his parents? From the various other father figures who have wandered into his life? What does his heartbreak feel like? What did it feel like the first time he kissed a girl? We wonder. Maybe that’s the point. We dwell on these later passages, the scenes growing longer and longer towards the end of the film as if to simulate the clarity of memory we find in maturity. Young Mason remembers flashes, while teen Mason can recall entire sequences of events, complete with the joys and pains therein. Haircuts change, Obama signs are put out on the lawn, Arcade Fire is heard, Linklater directs his camera. Life continues on. There’s that repeating notion again of a point. Maybe that’s the point, maybe this is. When Arquette as harried mother Olivia wails, “I thought there’d be more,” she speaks for us. She speaks for everyone walking the earth. Boyhood doesn’t have drama in it, it transcends it. Maybe there is no point, or maybe that is the point. Life is here instead.